I recently wrote an article for Sure Dividend entitled “Consider Equity REITs for Your Next Investment“. In that article, I listed nine equity REITs (eREITs) for dividend investors to consider in light of the drubbing that eREIT valuations have recently taken due to fear of rising interest rates and to capitalize on the pass-through provision for REIT income included in the new tax legislation. Both of these topics are covered in some detail in the previous article. This article provides a more complete investment thesis for Iron Mountain, Inc. (IRM), one of the nine eREITs highlighted in the previous article. Iron Mountain, Inc. provides physical and digital document management, storage, and destruction services to both government and public/private corporations in the US and globally. Iron Mountain has an enterprise value of roughly $16B. Iron Mountain has been a public company since 1996 but officially converted the corporation to REIT status January 2015 though it had many attributes of a REIT in place prior to officially converting to a REIT. Converting to REIT status commits the company to paying out 90% of taxable income to shareholders and provides corporate tax benefits to the company. While based in the US, IRM has operations in 45 countries on 6 continents and employs 24,000 people globally. Iron Mountain provides data protection, document storage, and destruction services to 95% of the companies in the Fortune 1000 list of companies. 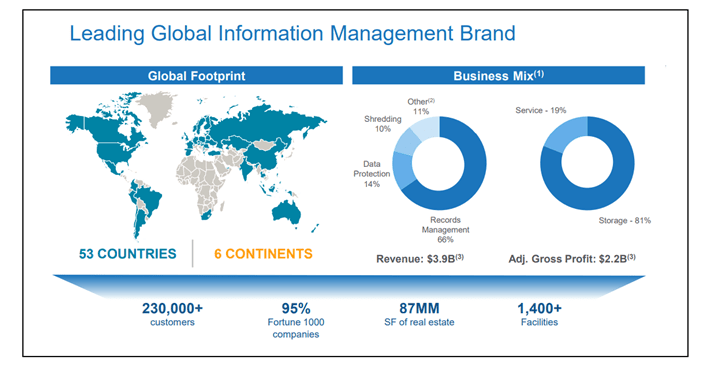 The chart below provides a good summary of IRM’s geographical footprint and its business. Iron Mountain has a rather unique business with long term storage contracts for legacy documents. A significant fraction of corporate client documents are still in storage after 20 years. These long term storage contracts provide a solid base of revenue and earnings for IRM on which to build. The chart below shows IRM’s total cubic feet of storage (stored boxes) continues to steadily grow. While IRM’s total boxes of documents in storage continues to grow the company is not choosing to simply sit on its laurels (or boxes) but has developed an aggressive plan to grow the business through similar integrated data storage services. The chart below shows IRM’s expected revenue breakdown between its legacy storage business and its growth in emerging markets and data centers. Revenue and earnings from further penetration into emerging markets is expected to grow over the next couple of years but the most significant growth is expected in new data centers. With a high percentage of its data centers capacity already leased, high annual retention rates, significant expansion potential, and high demand growth for data center services, IRM is making a strong push for continued growth and business diversification. Iron Mountain’s near term financial performance has been very solid as evidenced by its growth in adjusted funds from operations (AFFO) and its dividend distribution. A short note here for investors not fully versed in eREIT financial metrics. Because eREITs have very high depreciation write-offs which are tax accounting entries that do not affect cash flow, the usual metrics of earnings per share (EPS) and price earnings ratios (P/E) are not meaningful for eREIT financial reporting. The accepted metric for eREIT financial reporting is FFO and AFFO which are cash flow metrics. The following charts show IRM’s near term financial performance in those accepted metrics. The charts above show IRM’s AFFO/share and cash dividend distribution growth over the last 4 and 6 years respectively. Double digit growth in AFFO/share and high single digit growth in dividend distributions is very solid performance. Readers should note that only 4 years of AFFO growth is reported because IRM converted to a REIT corporate structure in 2015. Prior to that, the company operated as a typical corporation reporting earnings per share (EPS) which is not comparable to AFFO. The dividend payout ratio is also presented for eREITs in terms of AFFO. The chart below shows IRM’s payout ratio over the last 4 years. For the last 4 years, IRM’s payout ratio has been 90% or less. For an eREIT, anything less than 90% payout ratio is acceptable and less than 80% is good. Iron Mountain’s current payout ratio of 77% is conservative and certainly has room to allow for future dividend increases. With the general market currently experiencing a mild correction and eREIT valuations suffering further from fear of rising interest rates, why would I be considering an investment in IRM at this time? For the last couple of weeks, IRM has been on sale having fallen more than 18% in about the last 3 months. While the market has pushed eREIT valuations down over the last quarter, and particularly the past two weeks, due to fears of rising rates, history tells us that eREITs generally do well during periods of slowly rising rates and some eREITs will even beat the big market indexes under these conditions. This is particularly true for REITs like IRM since the economic conditions that are causing the Fed to tighten monetary policy will also increase demand for IRM’s corporate document management services. In addition to the increasing demand for IRM’s services, the recent tax legislation included a 20% deduction for pass-through income from partnerships, MLPs, and REITs. This makes IRM’s current 7.1% dividend yield all that much more enticing. For a more complete discussion of the impact of rising rates on REIT financial performance as well as a more detail on the new pass-through provision, readers should see my earlier article “Consider Equity REITs for Your Next Investment”. IRM is a well established and well run document and data storage company with a history of steady growth. With a solid backlog of documents in storage, continued growth in storage volume, and a growth strategy to capitalize on growing demand for data centers, IRM should experience solid growth through 2020. Recent investor jitters over rising interest rates has pushed IRM’s stock price into deep bargain territory and its dividend yield up to 7.1%. The partnership and REIT pass-through provision in the recently passed tax legislation will shield 20% of IRM’s dividend from Federal income taxes. With the economy picking up steam and projected GDP growth between 3-4 percent combined with the critical document/data storage services IRM provides, IRM is well positioned for many years of healthy dividend distributions and capital appreciation to today’s investors.